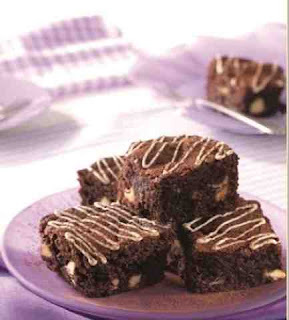 Dr Oetker have given me this wonderful recipe to share with you for flourless double chocolate Brownies - a perfect bake for Father's Day this Sunday! 1. Preheat the oven to 170°C (150°C fan assisted oven, 325°F, gas mark 3). Spray a deep 20cm (8 inch) square cake tin with Cake Release Spray to grease. 2. Break the Fine Cooks’ Dark Chocolate into pieces and place in a heatproof bowl. Add the butter and stand the bowl over a pan of gently simmering water. Once melted, remove the bowl from the pan and stir in the sugar. Set aside to cool for 10 minutes. 3. Gradually whisk in the eggs to make a thick and glossy mixture. Sift 15g (1/2oz) of cocoa and the Baking Powder on top and add the ground almonds, Natural Vanilla Extract and 150g (5oz) of Fine Cooks’ White Chocolate, cut into chunks, and carefully mix together. 4. Transfer the mixture into the prepared tin and smooth over the top. Bake in the oven for about 40 minutes until risen and lightly crusty on top – the mixture should be slightly soft underneath. Leave to cool completely in the tin then remove and wrap. Store for 24 hours. 5. To serve, melt the remaining white chocolate over a pan of gently simmering water. Cut the brownies into 9 portions and drizzle each portion with the white chocolate. Leave to set for a few minutes before serving, dust the brownies with the remaining cocoa powder.